Animonda GranCarno Original Senior is specifically composed wet food for older dogs. It contains all the nutrients your older buddy needs. The wet food contains real pieces of fresh meat and is available in two flavours. GranCarno Original Senior from Animonda is tasty and healthy wet food, specifically tailored to meet the nutritional needs of your older four-legged friend. The food contains 100% fresh ingredients and visible pieces of meat. The wet food does not contain any grains or soy. 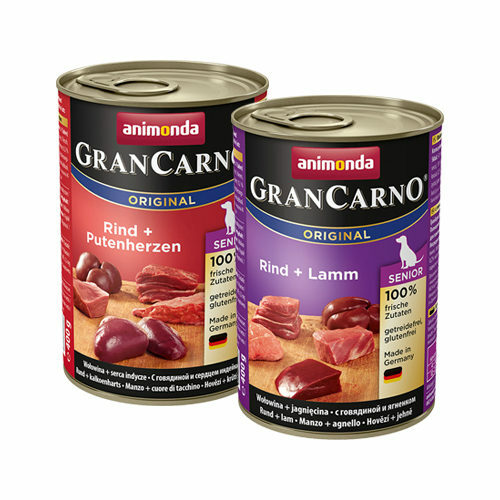 Animonda GranCarno Original Senior - Beef and Lamb: 43% beef (lung, meat, heart, udders, kidneys), 25% lamb (liver, tripe), calcium carbonate and 0.2% salmon oil. Animonda GranCarno Original Senior - Beef and Turkey Hearts: 53% beef (lung, heart, liver, meat, udders, kidneys), 15% turkey hearts, calcium carbonate and 0.2% salmon oil. Have you used Animonda GranCarno Original Senior before? Let us know what you think about this product.